By Darragh Mowlds | February 12, 2013. 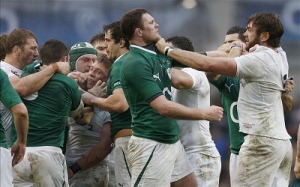 Sports Editor Darragh Mowlds give his two cents on Ireland’s abject performance in the Six Nations. As Irish fans wipe away the tears and pick ourselves up after a crushing defeat to the old enemy, we have to ask the question, what went wrong? The short answer of “absolutely everything” doesn’t cut it. Big name players failed to live up to the hype. Sexton’s inconsistency reared its ugly head again, before he hobbled off with a hamstring injury in the first half. Cian Healey’s tendency to lose his head was shown in all its glory; he and Ireland were very lucky that he wasn’t sent off for a stamp on Dan Cole. He has since been cited for that incident, as it was deemed intentional. When O’Gara came on, hushed murmurs in the crowd suggested that the veteran kicker could roll back the years. The comeback kid failed in his quest and the dream died out. George Hook’s prediction of an Irish win damned us from the start. To be fair to Hooky, no one expected the number of basic handling errors the Irish side had. Heaslip’s shaky start in the captaincy role continued, with Ireland’s number 8 failing to live up to the big occasion once again. He made several basic errors throughout the game. The Grand Slam dream is over, but the Championship isn’t lost yet. It appears that no one has told the French that the tournament has started, but once the memo goes through their performances have got to pick up. As for Ireland, a big performance is needed against Scotland in Murrayfield on February 24th, in order for Declan Kidney to regain some credibility after such a disappointing game. I wouldn’t be calling for his head just yet, but he wasn’t on solid ground going into the six nations. The English game won’t help his cause. Ireland’s walking wounded include Simon Zebo, who will be out for the rest of the tournament and potentially Brian O’Driscoll too. A life after BOD is too much to bear for some rugby fans. The true Irish captain will need to be fighting fit for this campaign to get back on track.